In the world of IT software product and solution sales, a product evaluation is often a mandatory step in converting prospects into customers. But getting prospects to the product evaluation stage of their buying cycle can require an exorbitant and often complicated set of actions. Today, technology buyers are spending more time than ever researching new technologies before moving into that all-important product evaluation stage. Therefore, nurturing prospects while they research technology solutions by mapping specific content to their specific research needs is the primary function of IT content marketing. It is also absolutely critical if an organization hopes to make a sale. 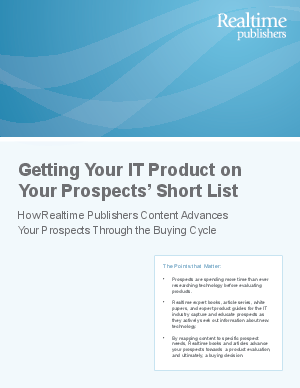 In this article, you will learn how Realtime Publishers books, article series, white papers, and expert product guides for the IT industry are written and syndicated to generate and nurture prospects through their research stage in order to advance them to the product evaluation stage of their buying cycle.